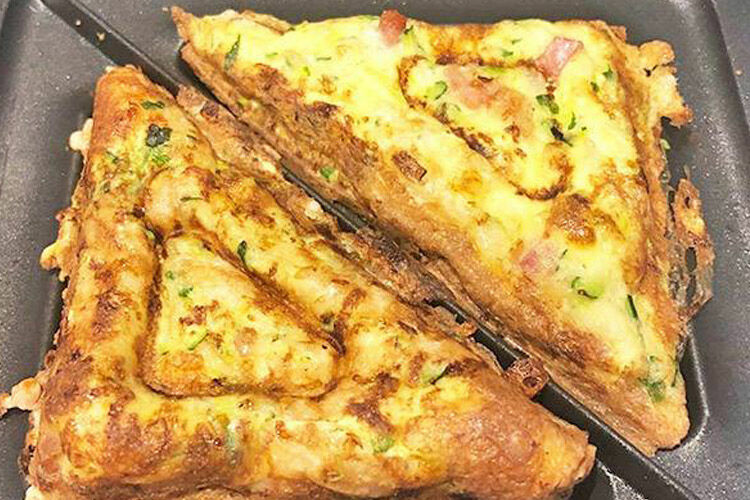 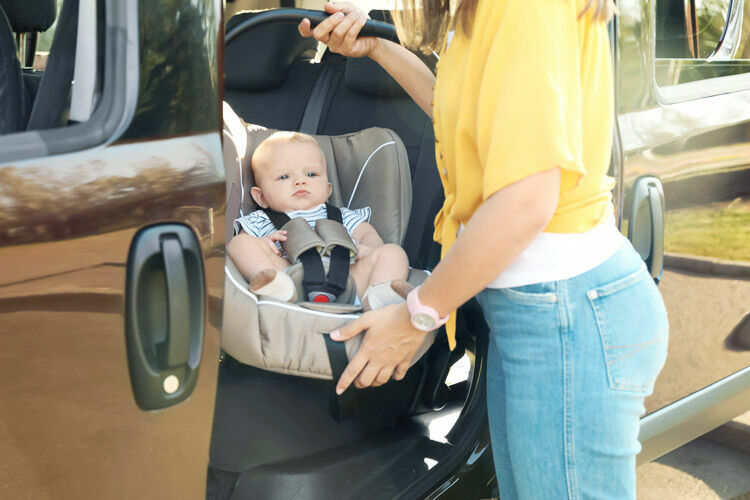 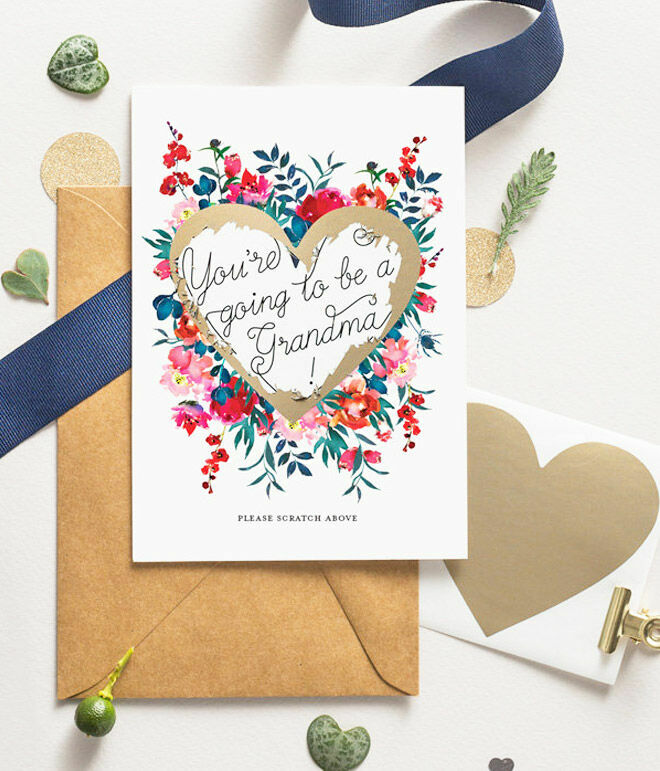 If you’re counting down the days till you tell your mum and dad that they’re going to be grandparents, we’ve got the perfect way to pass the time – prepare a brilliant grandparent pregnancy announcement. 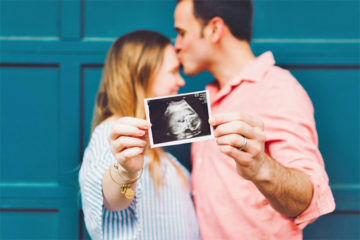 Dropping your ultrasound image casually on the table while you’re having a cuppa is one way to do it, but we’ve found a whole bunch of creative moment-makers that will give your announcement all the feels. 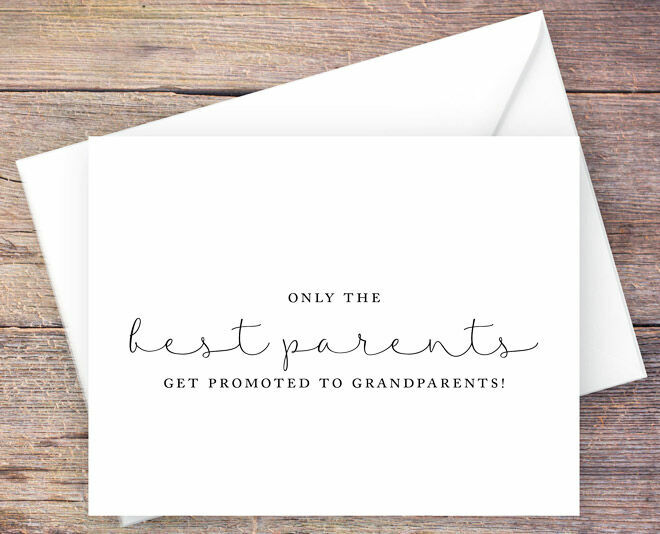 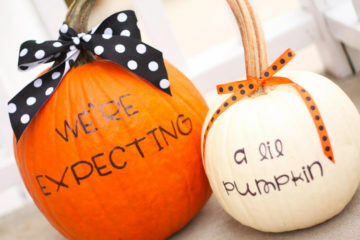 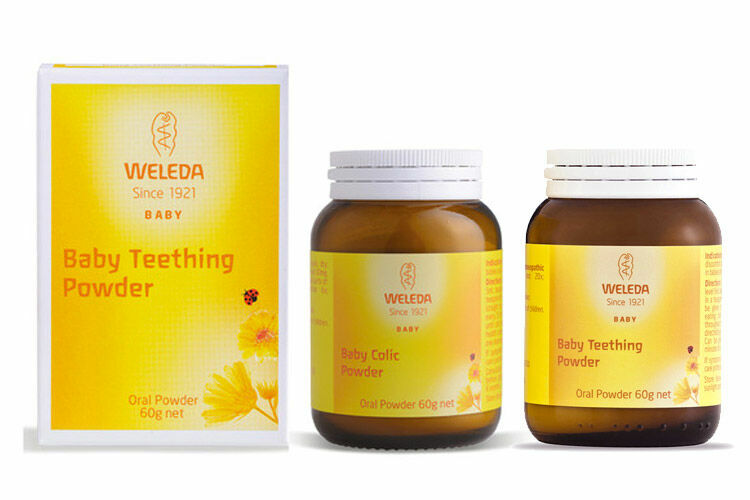 Here are 10 adorable ways to tell your parents they’re going to be grandparents. 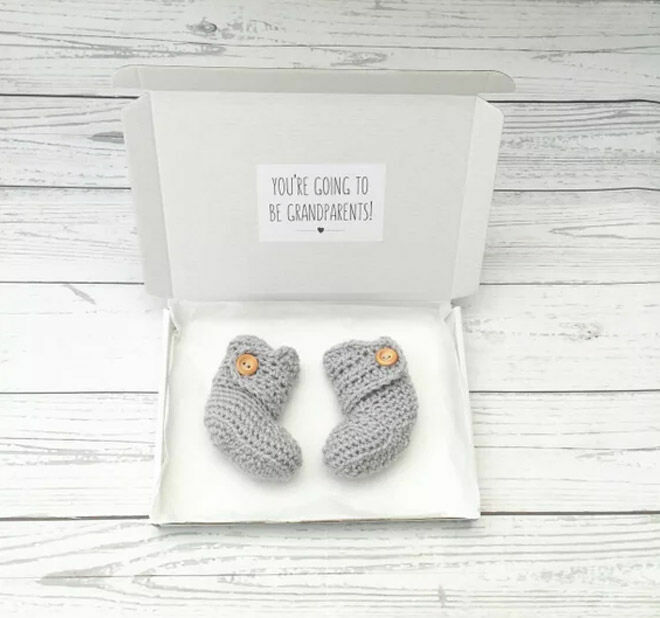 Pregnancy announcement booties: Simple and sweet, and something the grandparents-to-be can gaze at longingly for nine months. 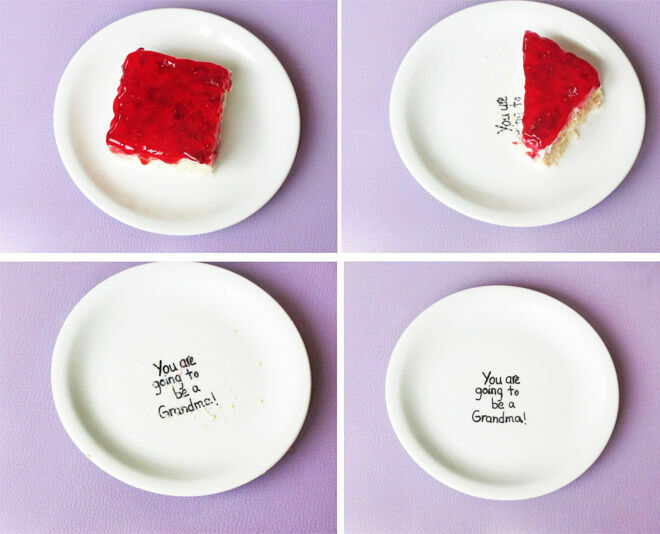 Pregnancy announcement plate ($21.32): Serve up afternoon tea on an announcement plate and see how long it takes for the penny to drop! 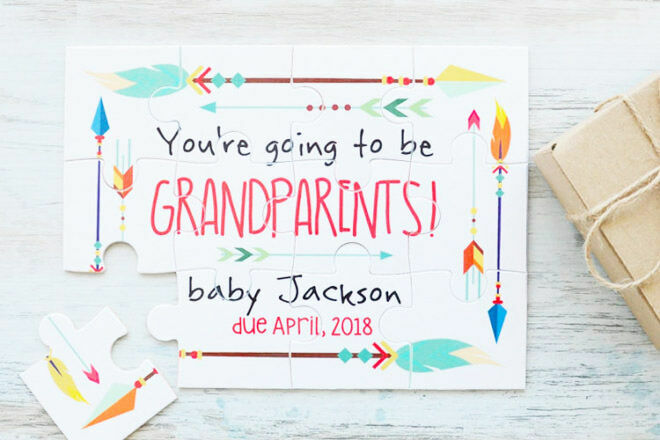 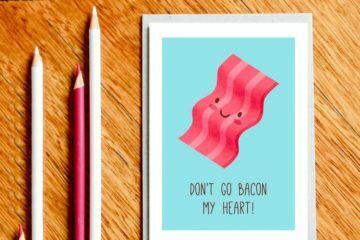 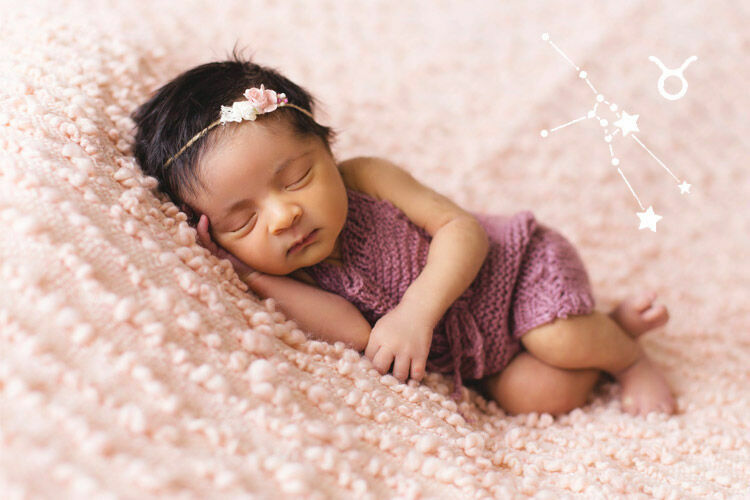 Printable pregnancy announcement ($3.11): A gorgeous, simple way to deliver beautiful news – congratulations grandma and grandpa! 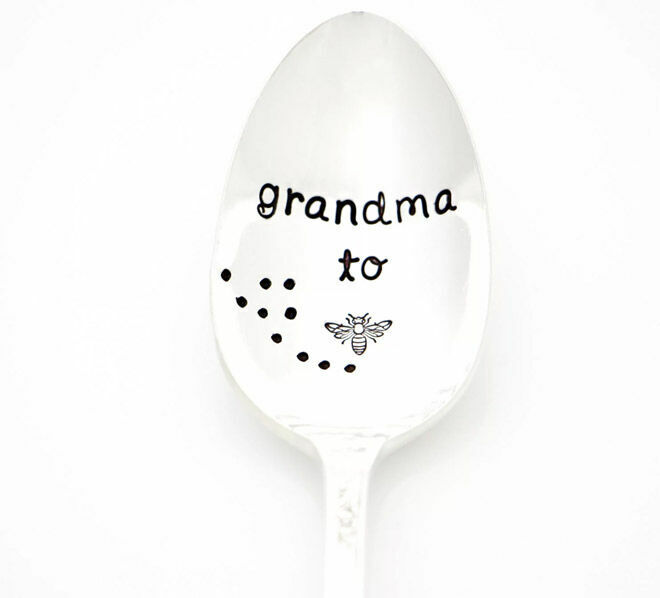 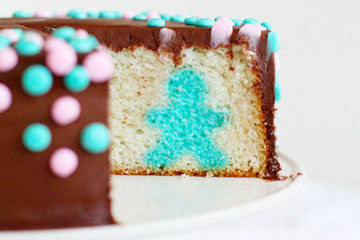 Stamped spoon for pregnancy announcement ($25.59): Mum’s morning cuppa holds a sweet surprise and a lifelong keepsake. 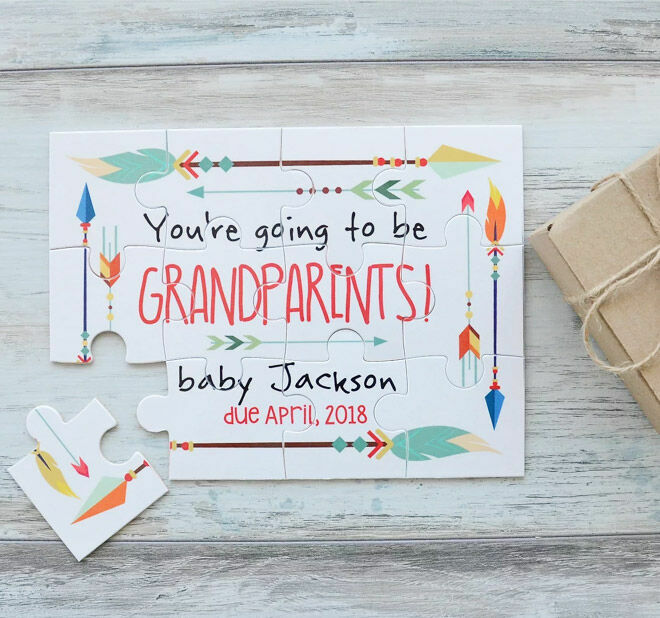 Personalised puzzle ($22.90): Watch the new grandparent’s faces light up as they finally realise what the puzzle says. 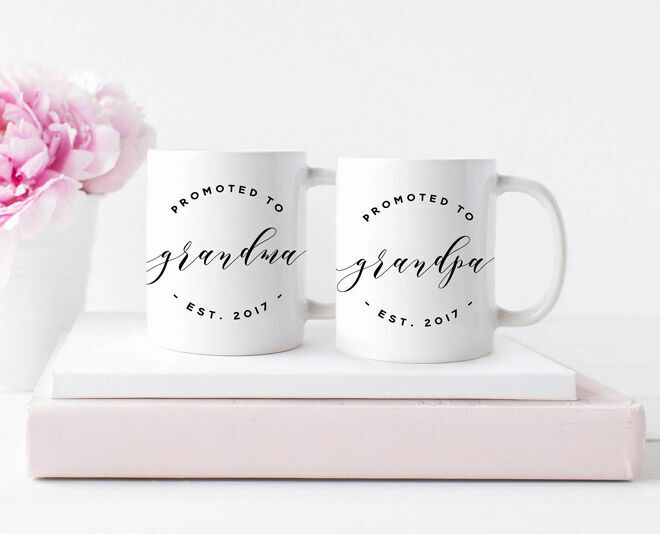 Pregnancy reveal mugs (from $18): Coffee and cake with a side of ‘surprise!’ for the new grandparents. 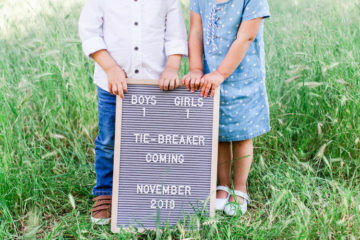 Pregnancy announcement scratch off card ($6.75): Who doesn’t love winning an amazing prize with a scratch and reveal?! 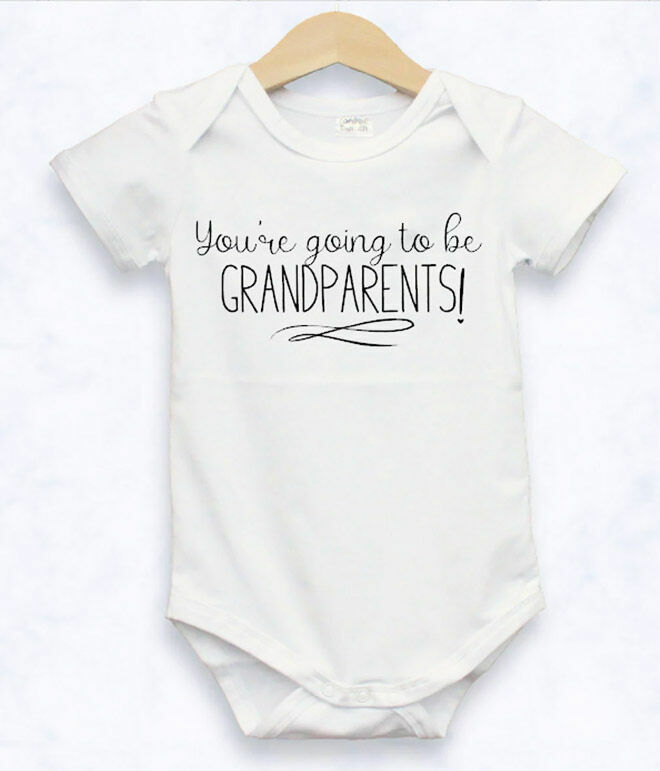 You’re going to be grandparents bodysuit ($22.95): A teeny, tiny onesie will give the game away and make it all seem very real. 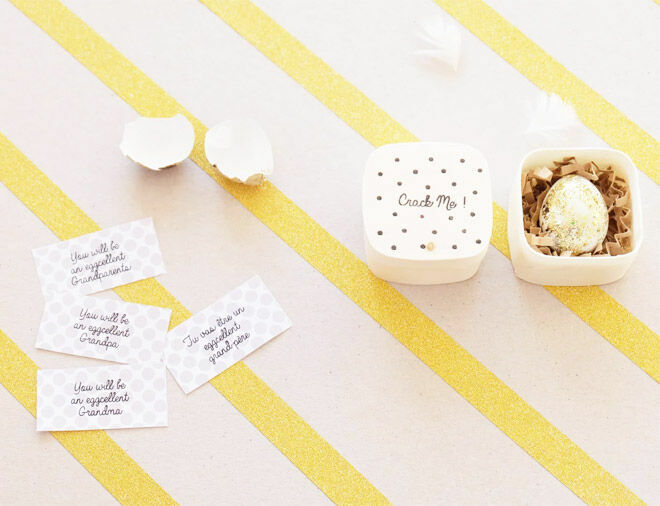 Pregnancy announcement personalised egg box ($19.48): Super cute and very clever, each little egg holds a little reveal note like: “You will be an eggcellent Grandma”. 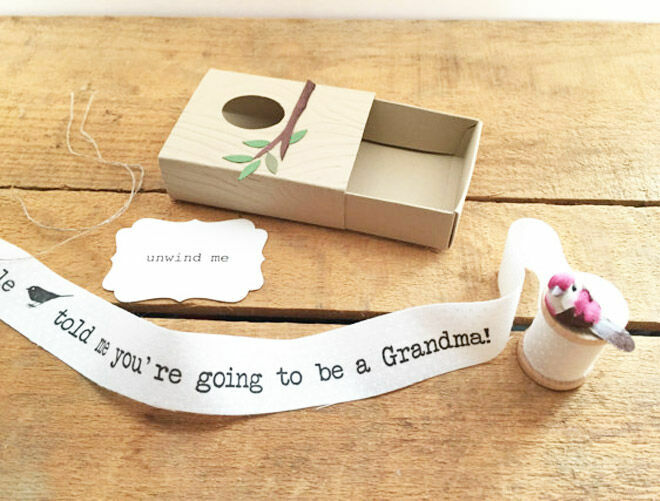 Pregnancy announcement matchbox ($28.42): Perfect for a crafty grandma – just unroll the bobbin for a cuter-than-cute surprise message. 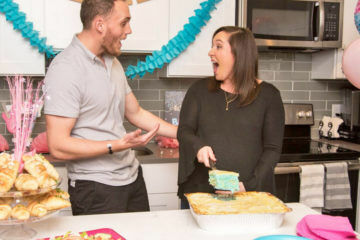 If you want to remember the moment forever, make sure you feel your parents reactions – these videos of parents finding out they’re going to be grandparents are just beautiful.